Christmas post. You see this is a bit of a metamorphosis of sorts. 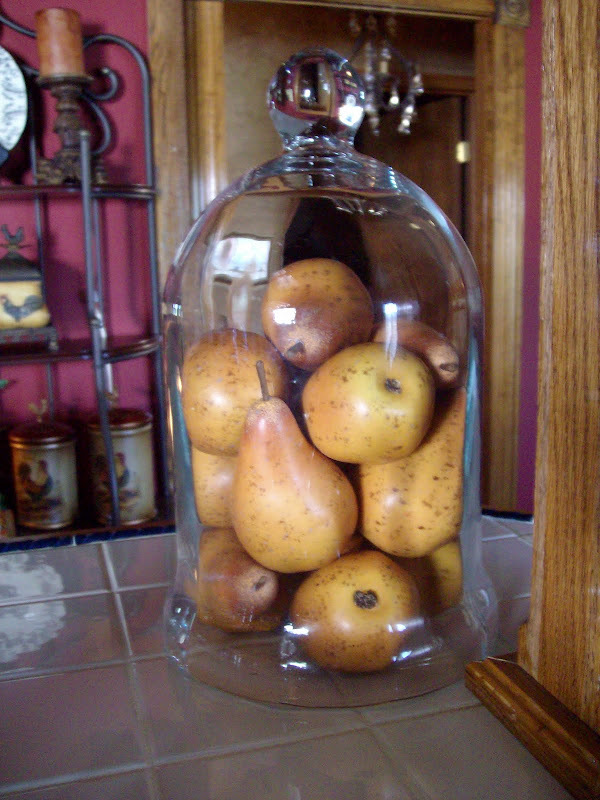 This is what you may have seen on this end of the counter during Marty's Cloche Party earlier this year. She put on quite the party. 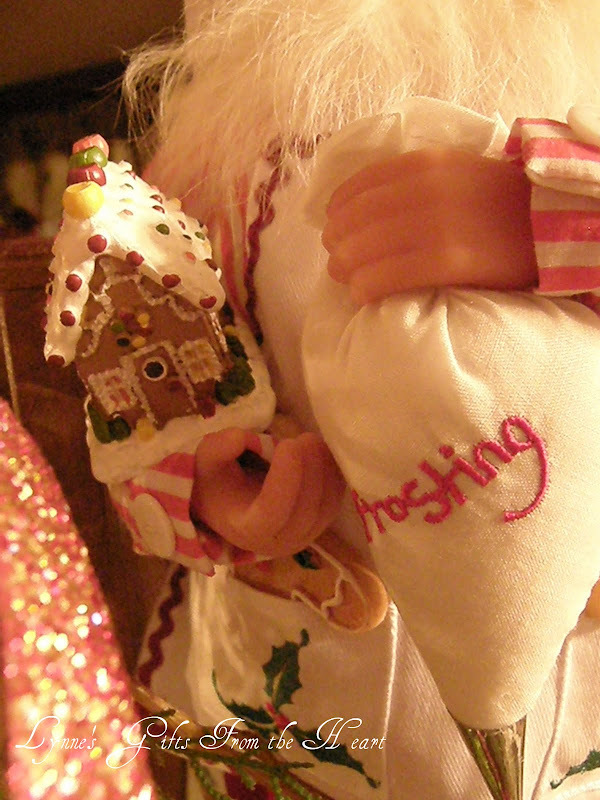 You can click on her name to scoot over to her beautiful blog. Marty, do you have another one planned?? Hint! Hint!!! 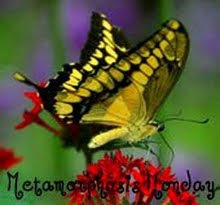 Metamorphosis Monday is hosted each week by Susan . She graciously hosts this event with many participating. It's a delight to see what all of you wonderful blogger's have come up with for us to admire. 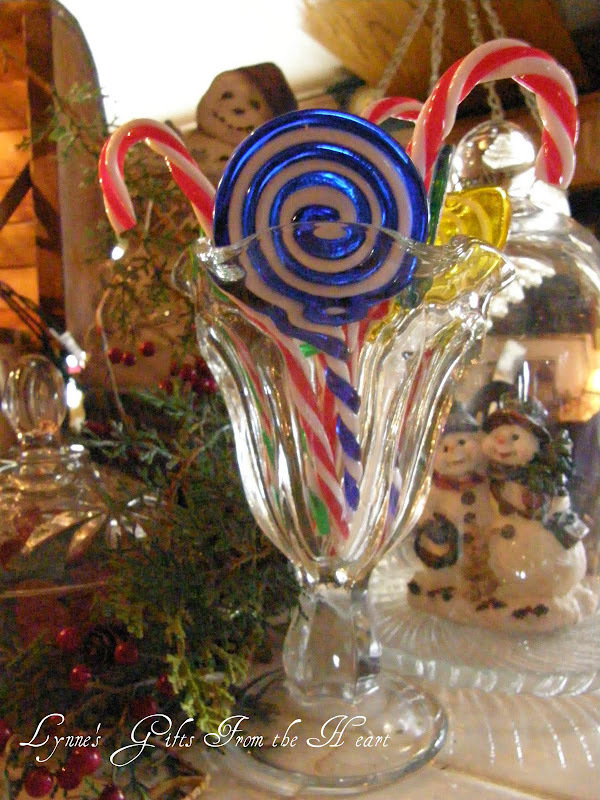 Curly ribbon and lollipops. What a wonderful combination. 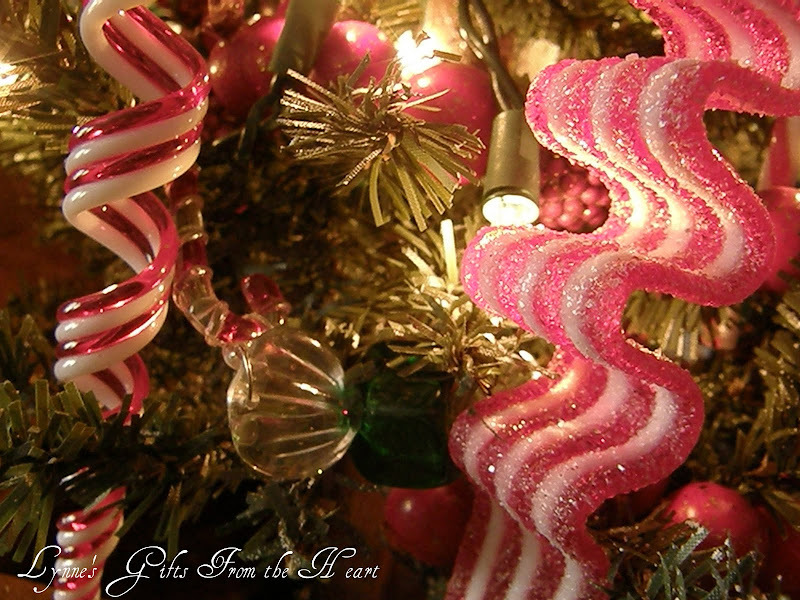 The candy cane garland I've had for a few years. I believe I got it at Dollar General. Did you catch the twinkle in his eye? I sat the small tree in a trunk I've had for over 20 years. Yikes!! Does that make me old? Nah!! Just a person that hangs onto things. :-)) And to think I almost put it in the garage sale box.. lol The hanging crystal candle holder to the right of Santa, was one of the last gifts My Betty gave me for Christmas. 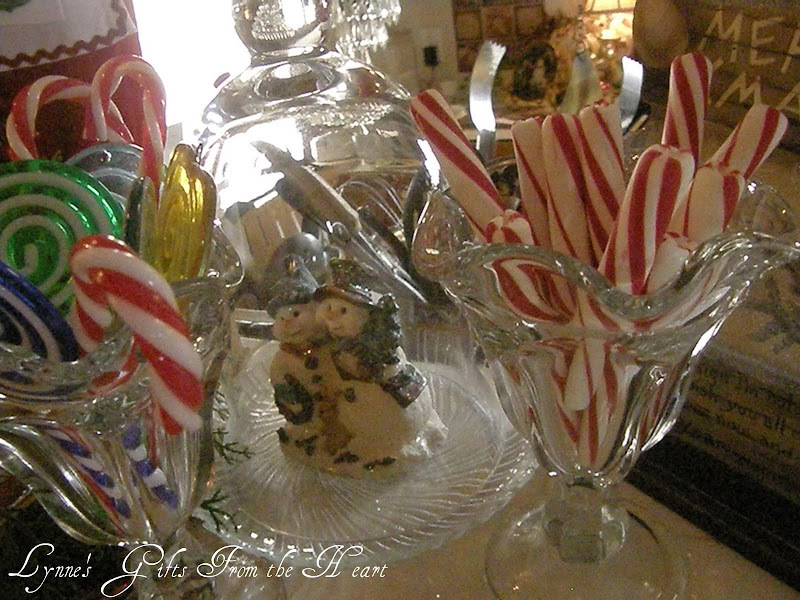 Help yourself to a peppermint stick. Naturally, I would add a snowman or two some where in this vignette. These little cuties worked perfectly under the cloche dome. I borrowed the crystal plate and paired them up. What a perfect marriage it made. As always thank you for swinging in and saying hello. 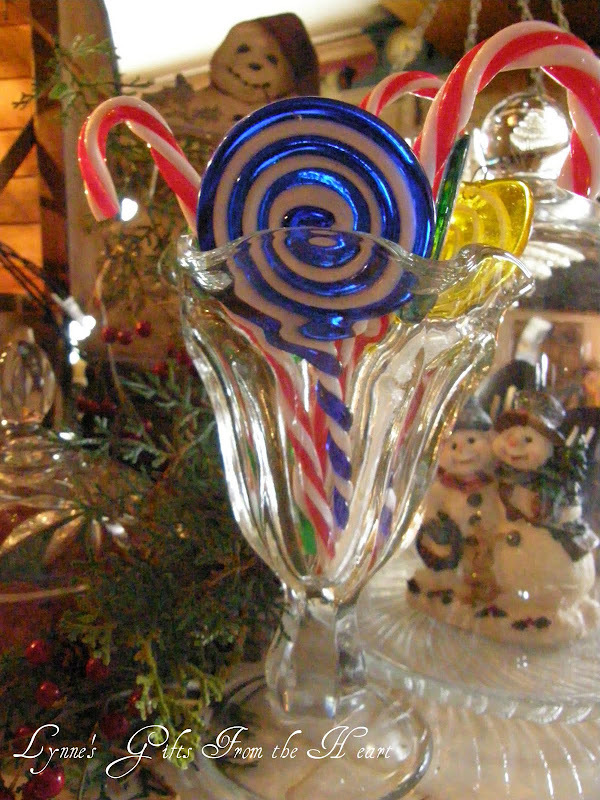 Before you leave be sure to grab another peppermint stick. Susan, thank you for allowing me to join in on this wonderful event each week. How funny, I swung into Kohl's last week to pick up a Christmas present..intent was to run in, grab the present and run out...there were 2 of these Santa's blocking my way and one grabbed my leg as I feinted and tried to run left....so, I had no choice but to bring him home. 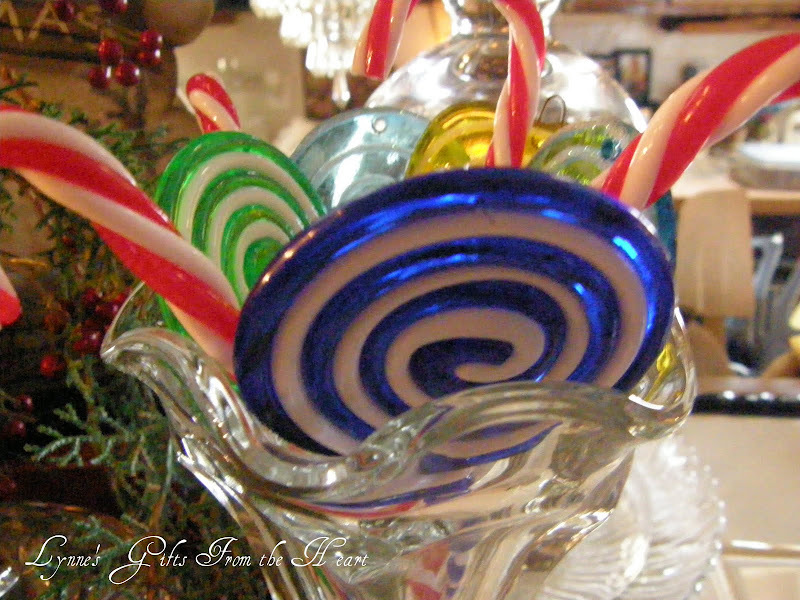 Love your candy decor...all looks good enough to munch. Wow Lynne, great job. everything looks great. I love LOVE your Santa. I checked out Kohl's and they don't ship to Canada. We miss out on a lot up here. It's even on sale.. Thanks for sharing your lovely home with us. Happy Holidays!! What a wonderul Santa!! I truly love your kitchen decor. We have a Khols here, but have never been. Just may need to check them out. 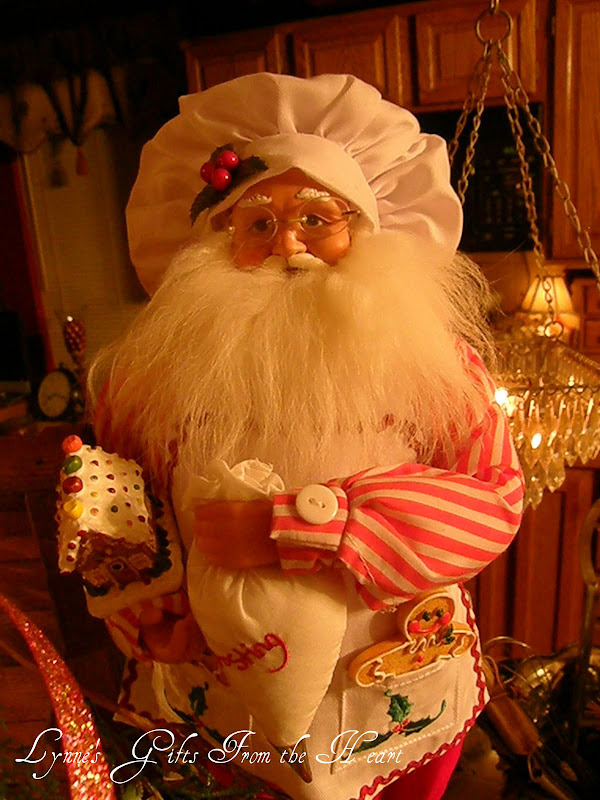 O, I have a kitchen Santa, too, that I love. 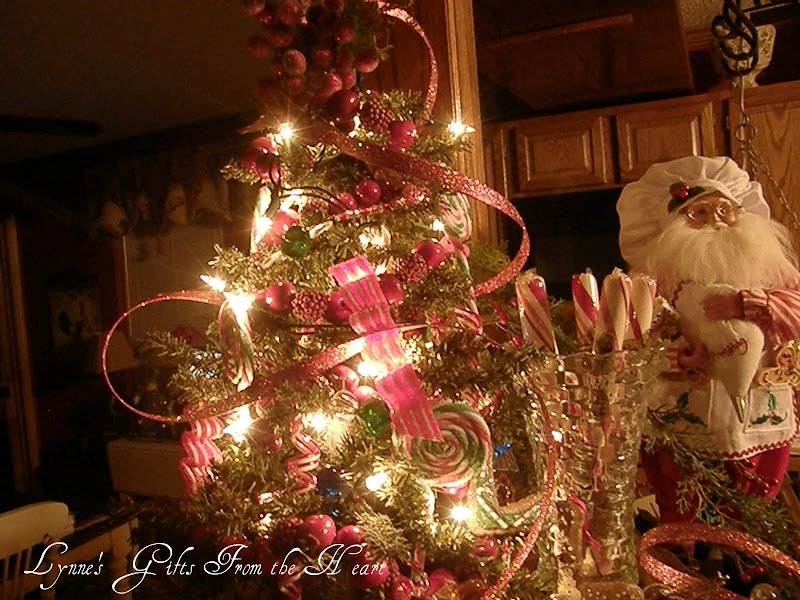 Now, I am going to spend the entire year gathering lovely things to go on a kitchen Christmas tree...your's is just adorable!! 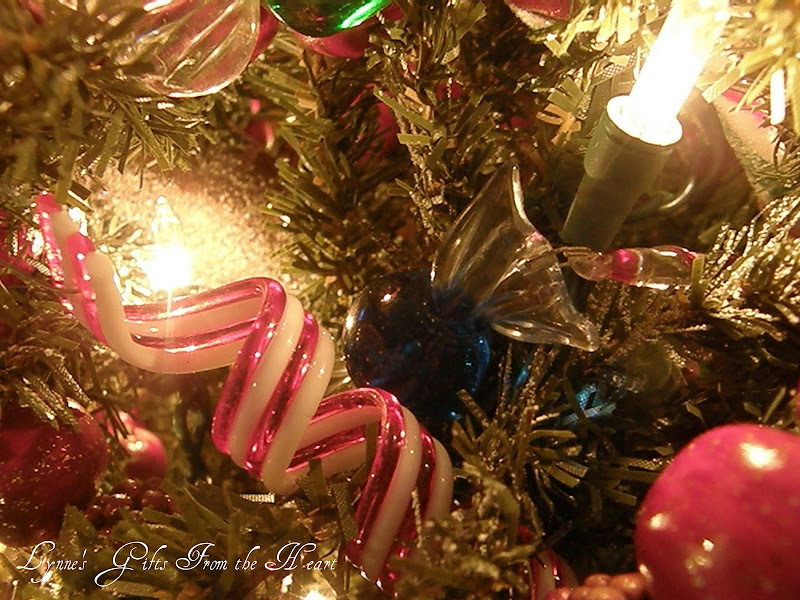 I must have some of those ribbon and glass ornaments...love 'em. 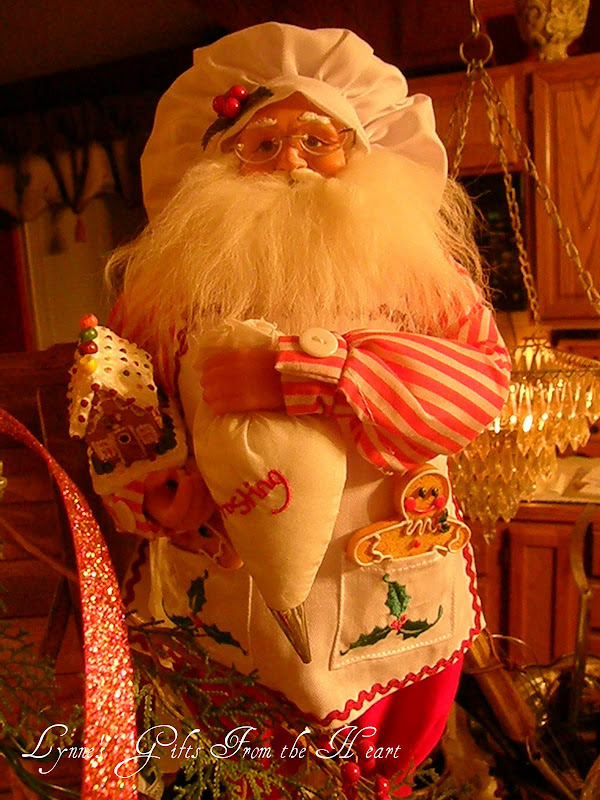 Lynne, your kitchen Christmas tree with your new Santa chef is adorable. Your photos are simply amazing. Everything looks like the real thing. 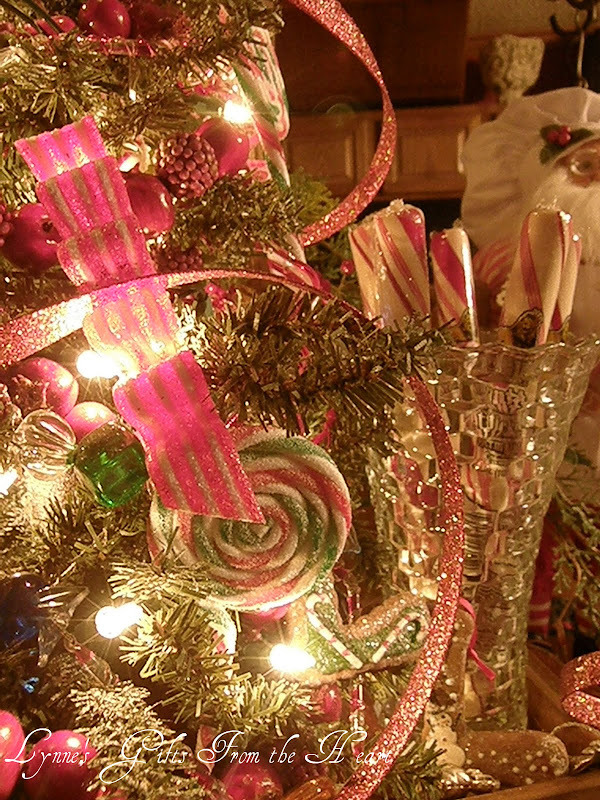 Love the ribbon candy ornaments. Your ornaments look delicious. 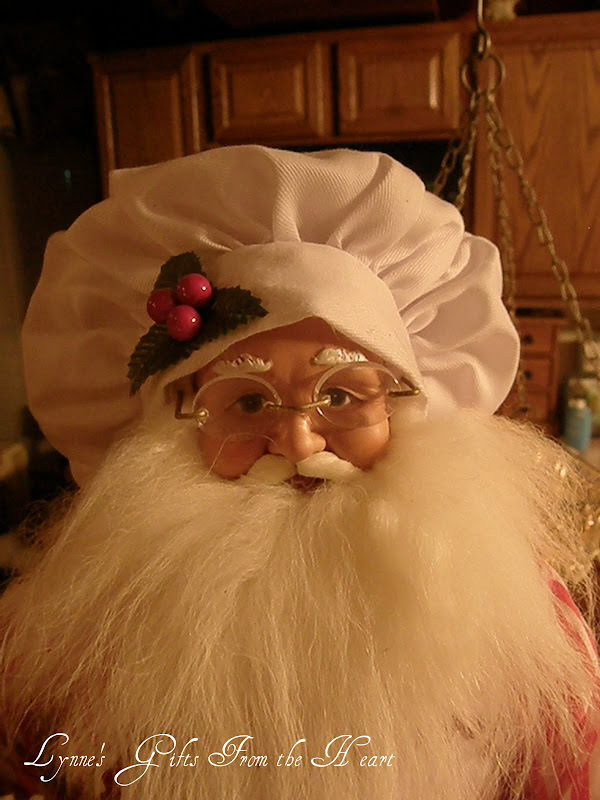 I love the baking Santa. What a cutie! Merry Christmas! what a gorgeous candy theme! I should try that in REAL candy :) My kids would love it. Those are so beautiful. That is an awesome collection and I love the Santa!!!! Wow, that is a lot of creativity. Thanks for letting me snoop around! Just whimsical and gorgeous! I feel like a little kid in the candy store! I need to get to Kohls, I so love that Santa! All your pictures are so beautiful and clear. I love the decorations on your tree! So pretty. So beautiful....your blog is the BEST....It has been such a blessing to meet you in blogland...You have enriched my life. 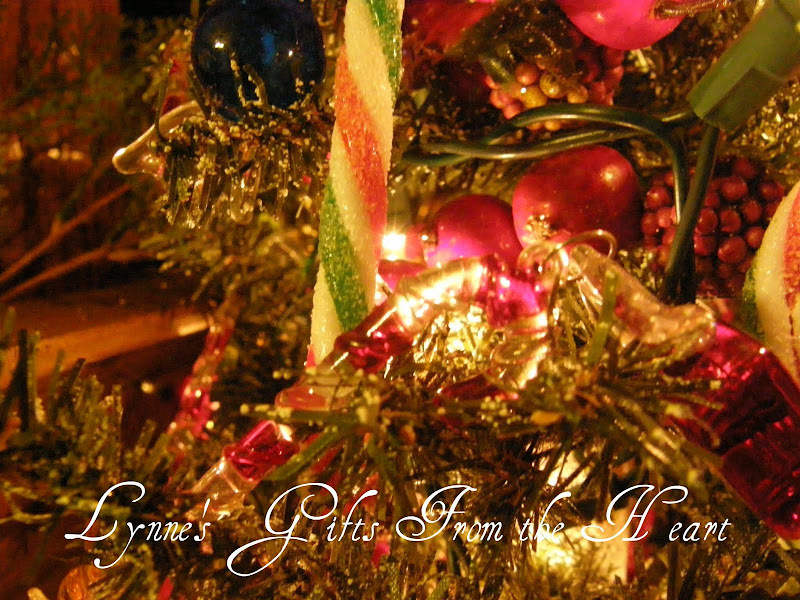 Blessings to you and yours....Merry Christmas and a New Year filled with many blessings. I loved your baker Santa. I have been wanting one like that one! I was at Kohl's Friday night and found a cute old world santa..wine and grapes. Couldn't pass it up. Your tree closeups are beautiful! 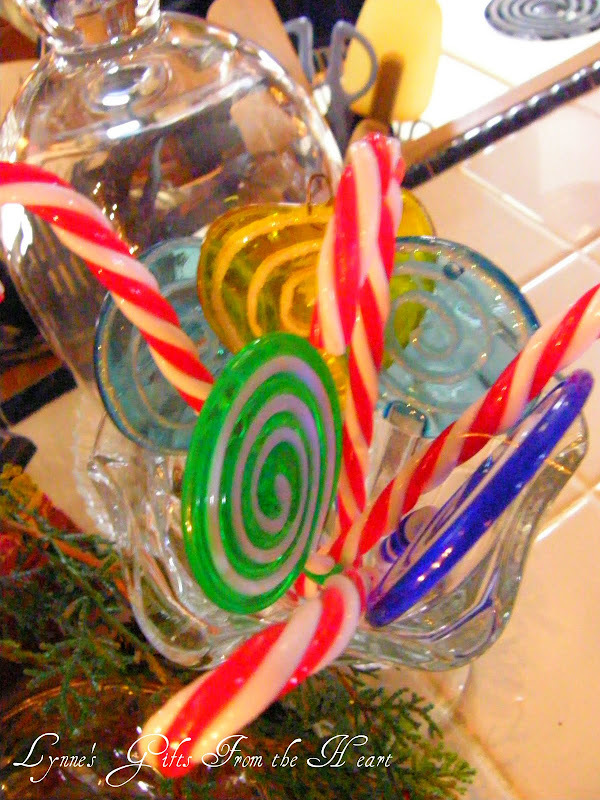 Enjoyed all the glass candy...so pretty. Hugs and Merry Christmas. What wonderful photos! I think I'm getting a sweet tooth looking at all that gorgeous eye candy!! 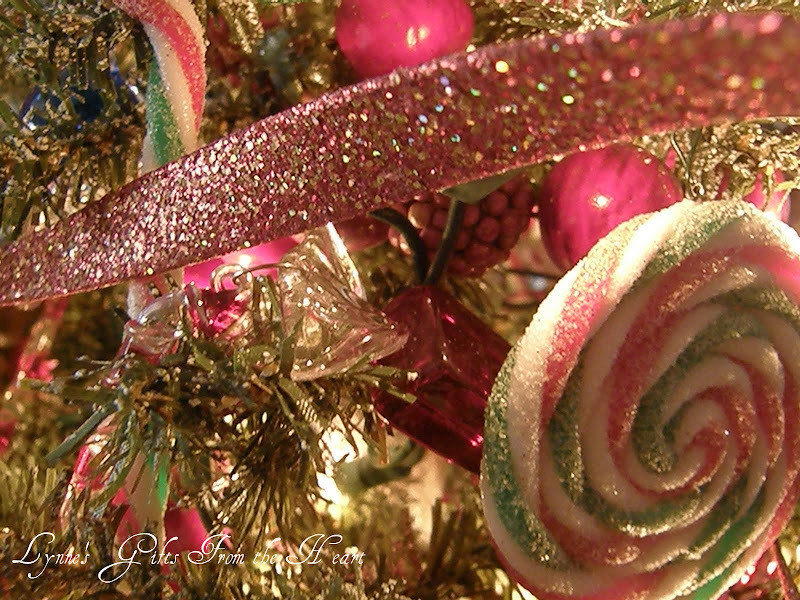 The pink and green sugary candy tree is absolutely stunning!! Hey I see you got your snow falling too!! Thats great! Many thanks for telling about your drapes. They are really pretty. Our Linens and Things store went out of business last year. 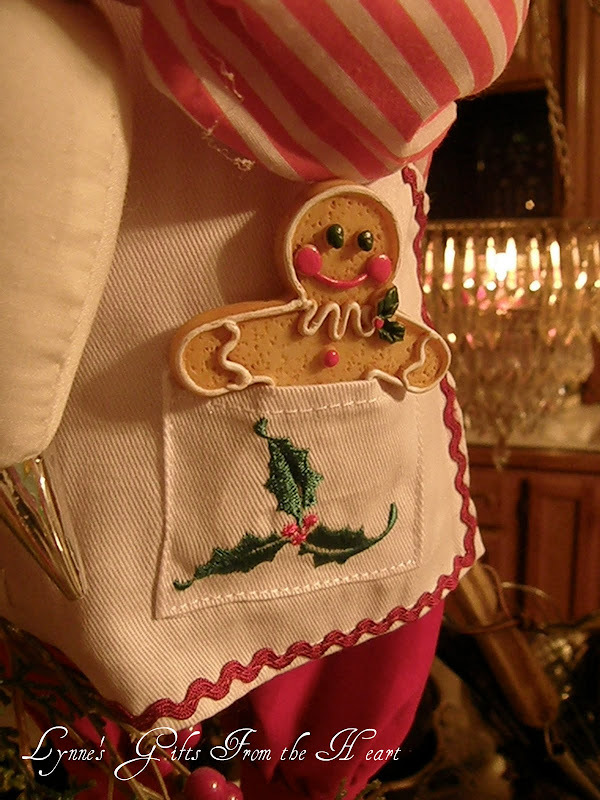 boo hoo..
Love your kitchen Santa, Lynne...he is the sweetest. Hope you & Mr. P.have a wonderful Christmas! 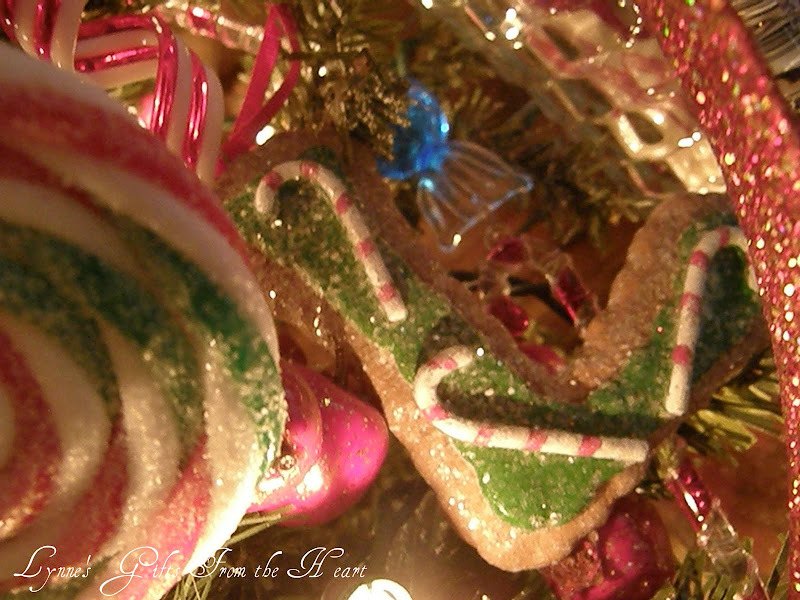 Hugs to you my friend~ J.
I hope you and yours have a blessed Christmas! That is such a cool display! I love your Santa. He's so cute! 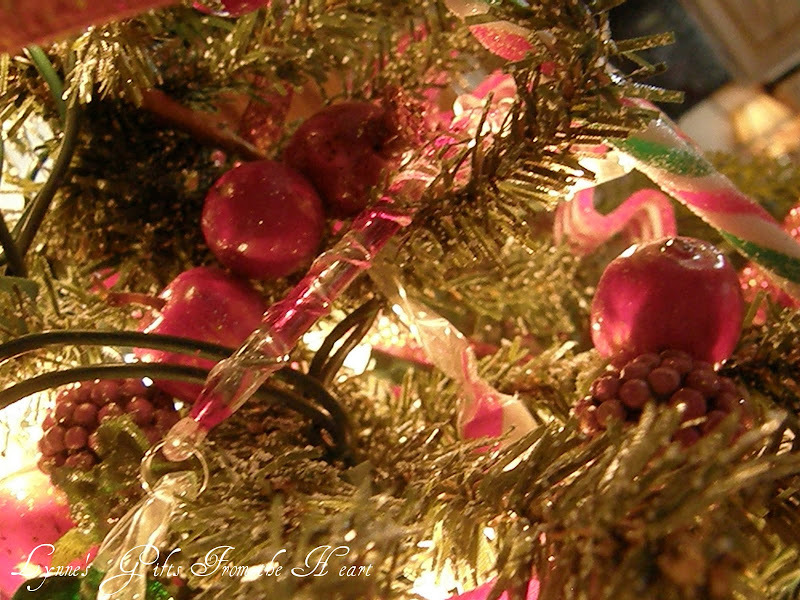 Those glass ornaments are beautiful! 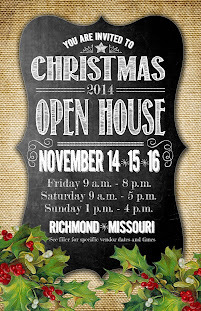 Your house is so festive and warm! I almost forgot....Thank you for the sweet/supportive comments you left me. I really appreciate them. I hope your daughter can get her BP under control. It's so hard sometimes! Gorgeous pics!! Thanks for sharing! I really enjoyed it! Oh I just adore your Christmas inspired metamorphosis. This post is truly eye candy!! I want that Santa chef. All of your pictures are gorgeous. What a beautiful theme- candy! Something after my own heart!! Lynne...what an awesome tree! 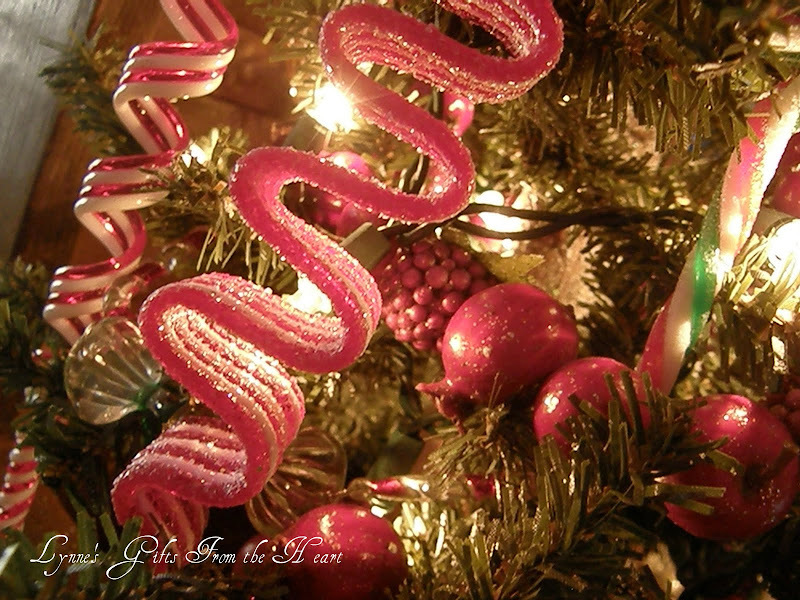 I LOVE the ribbon going all around...just beautiful! Your pics are wonderful...feels like a complete fantasy land! 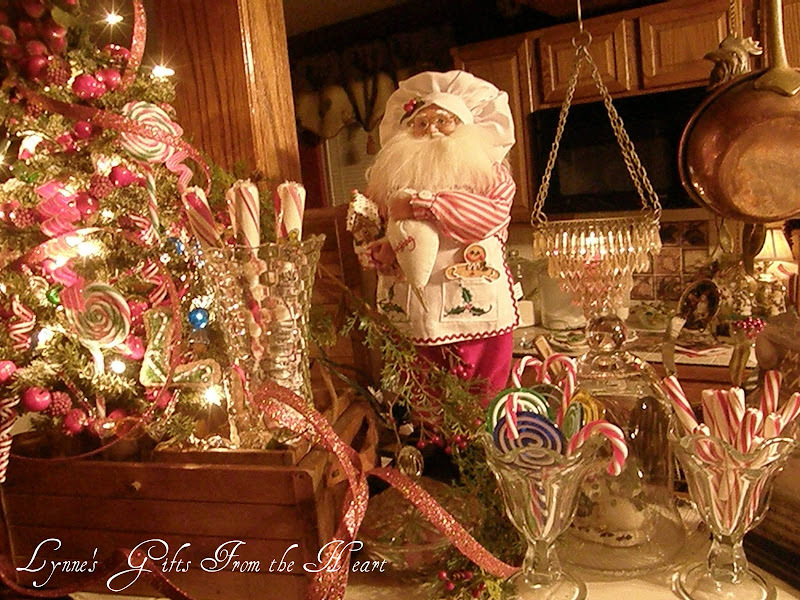 :-) What a fabulous Santa...he is perfect for this delightful vignette! Don't you just love Christmas....so much fun! Merry Christmas, dear friend! Hugs to you and Bill! Everything looks so yummy! 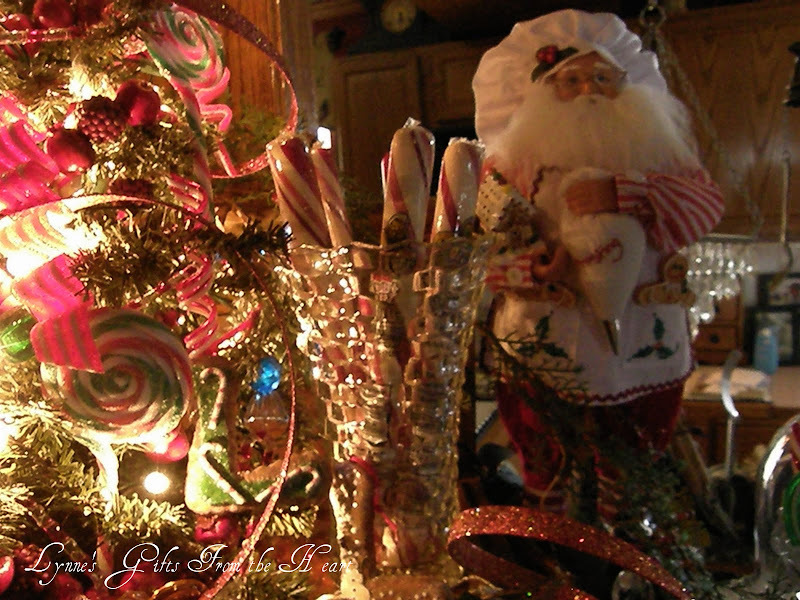 Christmas candy wonderland!! 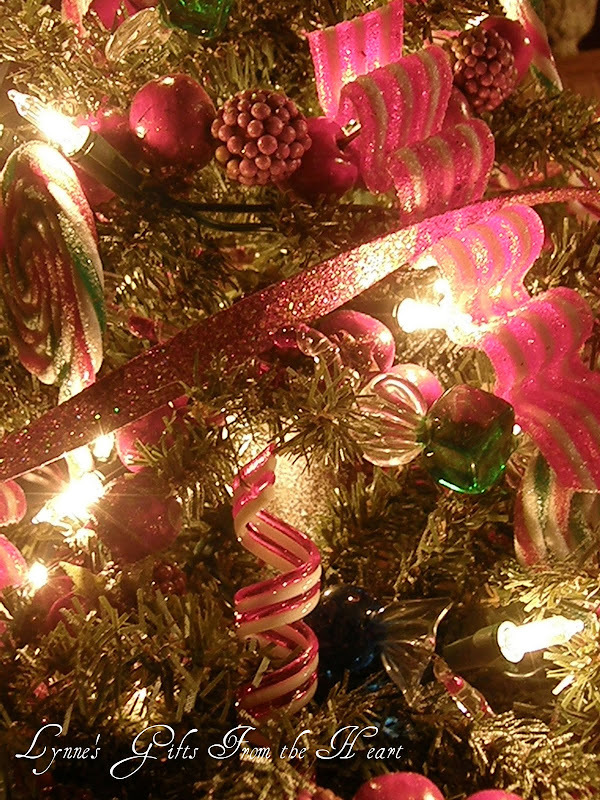 Love your tree and the candy ornaments! I love this idea in a kitchen especially. Yes, I saw that Santa, too, and just loved him. 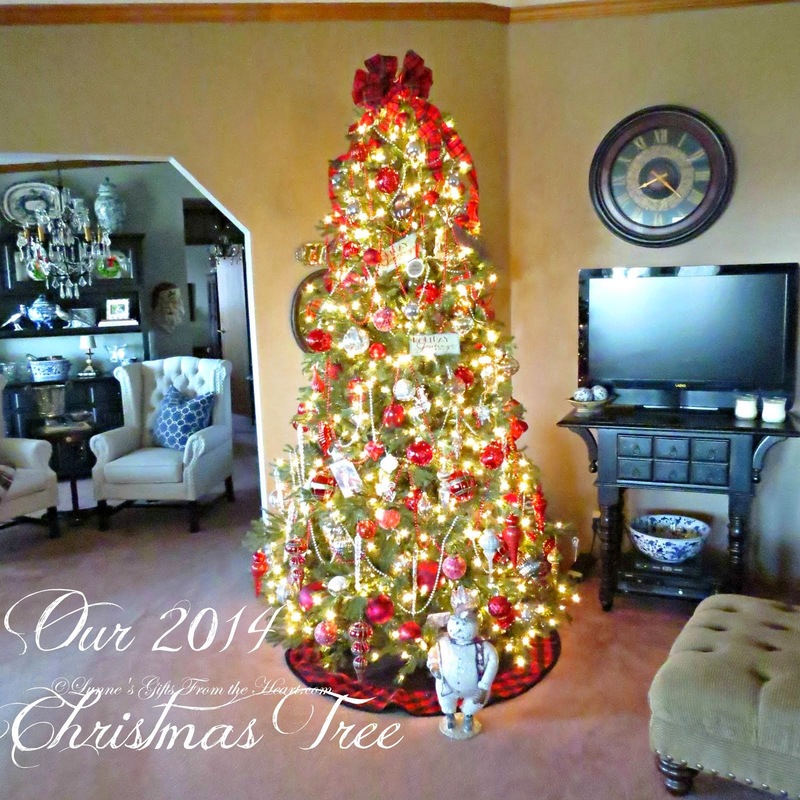 A perfect companion to your tree! What gorgeous photos! So much eye candy! It's all just gorgeous!